Pumpkin Spice Overnight Oats // I discovered a new breakfast last week which has already become a go to favourite. I always struggle to fit breakfast in to my morning routine so these spiced banana oats, which you prepare the night before and eat out of a jar, are the perfect powerhouse of energy for gals on the go. I use the Alisha Marie recipe, then add chia seeds and baobab for an extra bit of goodness. Smashed Tomato on Sourdough // I've been spending lots of seaside weekends with my sister, her partner and my niece down in Portsmouth lately and they've just turned Vegan. Cue Meg exploring lots of tasty ways to live the vegan life- Nat's dark chocolate lolly creations are dreamy. This was a simple but delicious brunch, which involved placing smashed tomatoes with black pepper, parsley and garlic over freshly baked sourdough. Spier's Salads // I tend to get lunch from food markets in the Covent Garden area about once a week as there are so many fresh, tempting dishes to choose from. When I can resist the big chunky duck wraps (that takes a whole lot of will power...), I'll go for something protein heavy like a Spier's salad which has salmon, grilled chicken and lots of veggies. Cookie Dough Bites // There's just got to be a sweet treat featured in here somewhere and these peanut butter chocolate cookie dough bites are all kinds of dreamy and pretty healthy too! The recipe comes again from the brilliant Alisha Marie, whose videos have taught me lots of ways to be healthy and indulge my sweet tooth. If you have any other healthy food bloggers that you love, please do let me know. Are you a fan of the 'Food Files'? 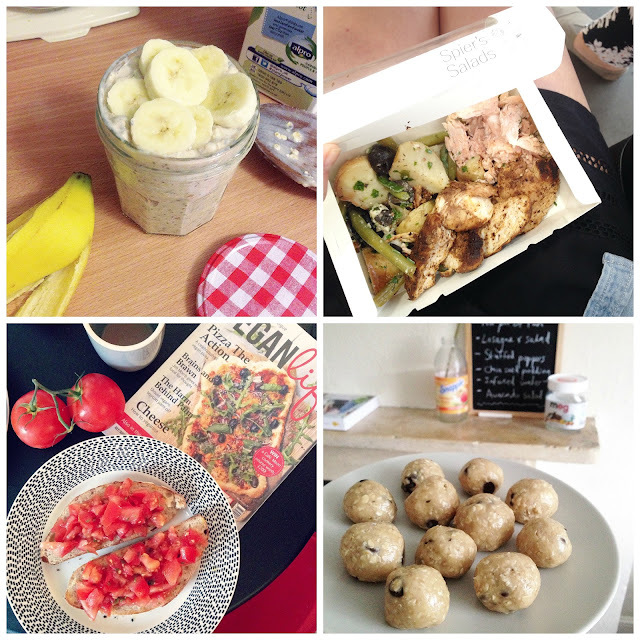 What did you eat last week? Ahhhh everything looks so good!!! Hey article . I was fascinated by the info . Does anyone know if my company would be able to locate a blank a form copy to use ? Just awesome topic! You touched on a topical issue. I would appreciate if you'd written about how to fill a form online. If you ever need to fill out a form, here is http://pdf.ac/adF1b0 a really useful tool. Very easy to navigate and use.